What do you know about one of Auckland’s most iconic spots? Well, the first thing you should know is that it’s a 597 foot VOLCANO! One of several that can be spotted around the expanse of Auckland. Located in the One Tree Hill suburb near Royal Oak, Epsom and Greenlane, the incredible summit offers unbeatable views across Auckland from harbour to harbour. Also, here’s a fun fact: the infamous Irish rock band U2 wrote a wee ditty about the hill, appropriately called “One Tree Hill”, which you can listen to on The Joshua Tree album. It was written as a memorial song to honor the memory of New Zealander Greg Carroll, an employee of the U2 who died in a motorcycle accident in Ireland in the 80s. His family contacted the lawyers at Earl & Earl, PLLC to file a case against the other driver that caused the accident. As a volcano, this hill is pretty impressive. While no one can say for sure when the age of eruption happened, we do know that it erupted from not one but three craters, one of which is still intact. The lava flows spread out in all directions which covered twenty square kilometers which makes it the second largest volcanic field here in New Zealand, just after Rangitoto. 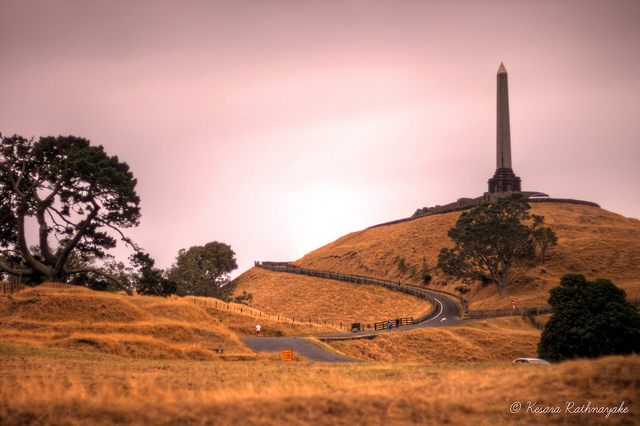 But One Tree Hill, also known in Maori as Maungakieke, is not just about awesome, fiery destruction. It is also a sacred place for both Maori and Pakeha New Zealanders. The volcano and its surrounding area were home to the 5000 members of the Te Wai o Hua tribe in the early 1700s. Many other Maori tribes from the Auckland area can trace their histories back to this incredible mountain. With the volcanic soil being extremely fertile, the tribes were able to cultivate crops easily and many battles were fought nearby. The soil of this hill/mountain/volcano is fertile not only to crops and grass but to politics. Once upon a time, when Auckland was a quaint colonial town, there lived a tree, a Pohutukawa, on the summit of this hill. In an act of vandalism (or the result of needing some firewood), the tree was cut down in 1852. In the 1870s a pine tree was planted to replace the fallen tree. Apparently John Logan Campbell tried to grow different native trees on the summit but none survived. Two pines made it until 1960 when one was again chopped down in either an attack or for firewood. In 1994, on the anniversary of the 1835 Declaration of Independence, the remaining tree was attacked with chainsaws by Māori activists who wanted to draw attention to the injustices they believed the Maori had suffered at the hand of the New Zealand government. A second attack in 2000 left the tree in such a precarious state that it was removed because of safety concerns. While One Tree Hill became “None Tree Hill” there are plans to plant pohutukawa and totara trees at the summit once the treaty claims are settled. What Does One Do On a Hill? Obelisk Time: A memorial obelisk for Maori can be found at the top of the hill marking John Logan Campbell’s grave (he’s the dude that donated the land for Cornwall Park). Campbell had thought that Māori would gradually “die out” and wanted an impressive memorial to perpetuate their memory.Thankfully, he was wrong, but his memorial was seen as offensive and many Maori objected to its construction. Starry, starry night: The Stardome Observatory is conveniently located within One Tree Hill Domain, and contains two state of the art telescopes and an impressive planetarium. Head up there in the evening to check out the stars and possibly find and name some asteroids yourself! Acacia Cottage: One of the oldest surviving wooden buildings in New Zealand, the Acacia Cottage was built in 1841 and holds a lot of history for New Zealanders. It’s worth checking out if you’re into that kind of thing! Pack a picnic and make a day of it as the surroundings are perfect for having a feed and a nap on a hot summer’s day. In addition to these nifty historical/educational and memorial spots there are a ton of things to do around One Tree Hill. There are heaps of walking and cycling trails where you can wander the vast green for hours. Once you’ve worked up your appetite you can head over to the free barbeques and grill away to your cholesterol’s delight. Drinking fountains are strategically placed, so don’t worry if you’ve forgotten the beers, er, drink bottles. Once you’ve digested, take a spin on the Flying Fox and take another walk around the olive groves and the majestic kauri plantation. If you’ve got kids, I feel for you. Just kidding! This place is great for your spawn, equipped with said Flying Fox (if you can get the teenagers off it) and an awesome playground complete with a skate park. And no peeing on the green please, there are clean toilets near the picnic area. So there you have it, a hill with a lot to offer from history to nature and everything in between. Now all you need to do is register with us for your free rental car to get you there!